Maidstone Victory Angling Society, supported by local tackle dealers West Malling Angling, Nick’s Tackle, Range Baits, Shop4tackle and D&A Angling, hosted a very enjoyable and successful Juniors day at the Great Danes yesterday. Nine youngsters turned up on what turned out to be another glorious summers day and all managed to catch fish and have a great time. A BBQ was provided along with snacks and drinks whilst members and relatives turned up to support and instruct where necessary. After lunch a competition was held, to see who could land the biggest fish, with George Busby claiming victory netting a 5lb carp. George received a Rod and Reel for his capture along with a torch, on a key ring, engraved with a carp motif. Due to the exceptionally generous donations, from all the aforementioned tackle shops, none of the kids went home empty handed. A raffle was held so each junior ended up taking a couple of bags of tackle home. It is very rewarding watching youngsters enjoying the hobby and having such a great time. A very big thank you to everyone who supported this event. Fish of the month goes to Sam Harris who banked Alex’s at 36lb 6oz along with at least four others in a busy weekend. The complex has certainly come to life in recent weeks with many of the stock fish seeing the net and putting on weight. Sam Harris proudly shows off the best of his multiple weekend catch. Please do not drive on the tarmac path on our downstream section at Barming. The path is not of suitable construction to support road traffic. We had one instance of a member driving down as far as peg 9 and parking up. Use the track to the left and park to leave the track clear for other anglers to get by without having to drive on the path. Signs will be put up shortly. Mote Park has now reopened following its annual June break. Please note the cost to park here has now doubled to £2. Make sure you display your extension permit which was provided with your membership along with your £2 pay and display ticket if you intend to be there for more than 6 hours. With the rivers now open, the match scene is now in it’s busiest period. 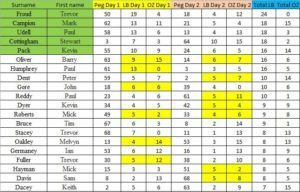 Numbers are at a ten year high with 31 competing in the opening Medway match of the season, which was won by Jeff Saunders and good numbers also showing for the Evening Shield series. Trevor Froud has secured the Evening Shield once again with a match to spare. Well done again Trevor. The River Beult match was again a tough affair with only 18 deciding to test themselves on this tough venue. Mike Rose tempted three Tench to win at a canter, while many struggled to put 1lb on the scales. 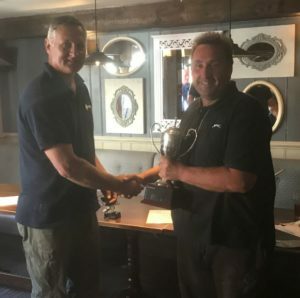 The second Medway Masters, our two day festival, attracted 48 anglers from as far as Nottingham and Birmingham but it was again local lad and club member Trevor Froud who took the Trophy and £400 first prize. Top 20 anglers. Yellow indicates section winning weights. A big thanks to all those that assisted in getting the river in tip-top condition and also those who came and weighed in over the two days. 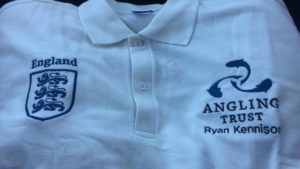 Last but certainly not least, a big MVAS well done to our young member Ryan Kennison who is now officially a Team England angler and we’d like to wish him all the best for his debut in Ireland in August.